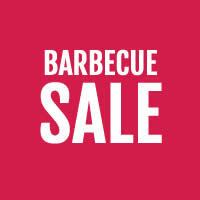 If you are looking for the latest BBQ tools and barbecue utensils, we have a huge range in stock. 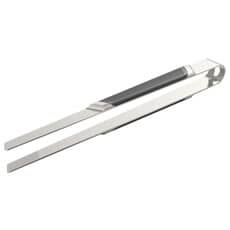 Many homeware brands make BBQ utensils, but we only stock the best, such as those made by Weber, Napoleon, Outback and Broil King. 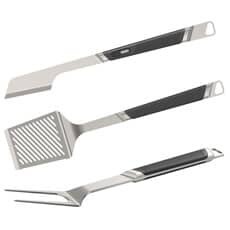 BBQ tools need to be made by people who understand grilling. They must be robust, balanced and comfortable to use. Style comes as standard with these items, as does quality. 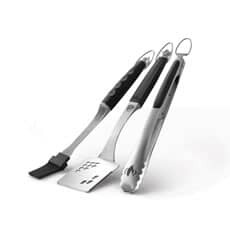 A smart new BBQ tool set makes a great present for a keen outdoor chef, and we have plenty to choose from. 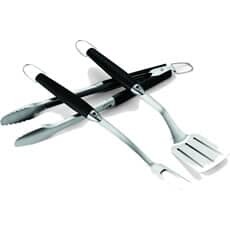 We also sell great quality basic tools, such as tongs with non-slip handles, grill cleaners, and stylish silicone marinade brushes. You can also add some new items to your collection. What about some meat shredding claws? 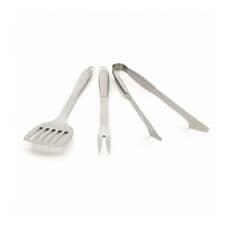 These are a excellent tools for those who are enjoying the pulled meat trend - easy to achieve on a bbq. When it is time to serve up, bear claw tools make very short work of pulling apart your tender meat fibres, and provide a showstopper moment for guests. 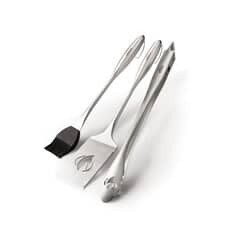 Top sellers in our utensils section include our Napoleon Pro 5 Piece Tool Set, the Bodum Grill Tool and the 'must have' Napoleon Non slip stainless steel tongs. Prices start from under £5, and include VAT, so why not smarten your tool kit up this summer? 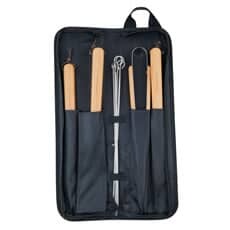 To enjoy the best homemade grilled food, you not only need a good quality barbecue and ingredients, you will also benefit from having some of the best BBQ utensils around. 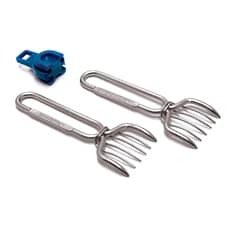 These can include everyday items like spatulas, but that are designed for use on outdoor grills and that can be stored with your barbecue when not in use. 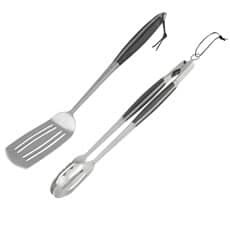 You can also buy utensils to improve your recipes, such as meat tenderisers and burger presses, and essentials like skewers. Choose the utensils that you buy according to the type of food that you already cook, or that you want to. 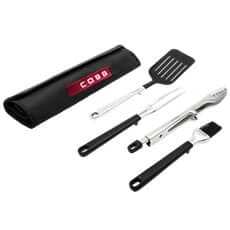 If you want to cook cuts of meat, then a basting brush offers a convenient way to be able to add extra flavour to your food, simply and without having to try and compromise by using other implements and utensils. 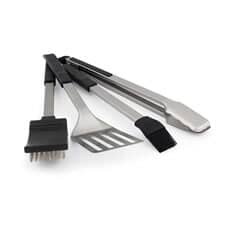 Most of the major manufacturers, including the likes of Weber, Napoleon, and Outback, do produce their own utensils but you don't have to match your utensils to your barbecue or your BBQ accessories. 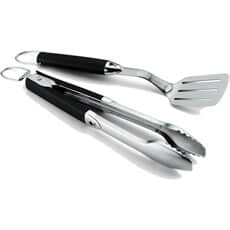 At BBQWorld, we understand the importance of having the right tools at hand, and this is why we have a large catalogue of functional and beneficial cooking utensils that you can use on your grill. We provide competitive prices on all items, and we also deliver orders valued over £50 to UK addresses completely free of charge. Browse our secure website to find the utensils you're looking for, call in to see our team at Dawson's Department Store, or call and speak to one of the knowledgeable and friendly team, if you want any specific information on the products we have or the service we offer. 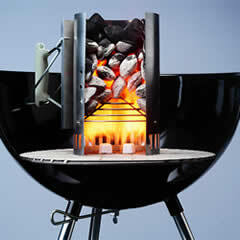 Weber is arguably the biggest and best known brand in the barbecue world. 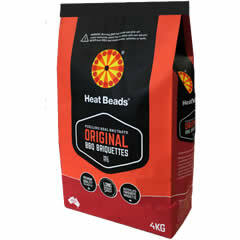 They are believed to have been the first manufacturer to have created the kettle barbecue, which has become a staple in many peoples' garages, and since the early days, they have expanded their product line in order to attract more and more people to buy Weber barbecues. 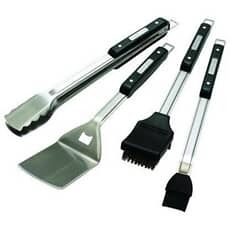 As well as making some excellent quality grills, Weber also provides equally high standard grilling accessories. You can buy replacement parts for their popular BBQ models, you can buy covers to help protect your outdoor grill investment, and they even publish BBQ cook books that enable you to master the fine art of preparing food on a BBQ. 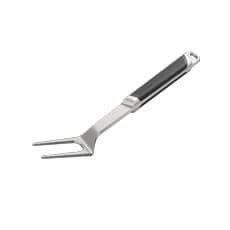 Weber also understands the importance of having the best tools to hand, and this is why they launched a large selection of BBQ utensils. 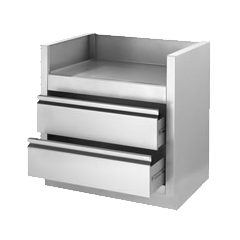 The Canadian manufacturer, Napoleon, started by producing steel railings in 1962, but the company has been producing wood stoves for more than 30 years now, and they have brought this experience to the manufacture of outdoor grills as well. 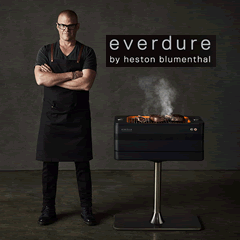 Today, they specialise in the provision of gas barbecues, but you will also find a great selection of charcoal grills too, and many of the design features you see on today's models of Napoleon are updated and improved versions of the features of some of the first stoves. Their methods are tried and tested, and this shines through in the quality of the items that they sell. 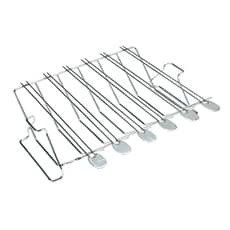 Buy a host of gas and charcoal barbecues, ensure that you have all the accessories that you need, and don't forget to stock up on Napoleon barbecue accessories that are designed to make your cooking and serving experience a little bit easier. Outback was established as a family run business back in 1979 and it continues to produce durable and feature packed grills today. They are particularly known for their innovation, and if you like gadgets and high-tech cooking options, then Outback barbecues are an ideal choice for your garden. Outback products regularly win awards and are consistently voted among the top barbecues on the market in surveys and questionnaires. 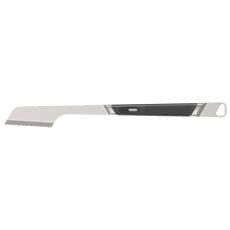 Of course, no matter how good the barbecue is, you will want to have a good selection of tools and accessories to cook with, protect your grill, and clean and maintain your BBQ. Outback also manufactures these types of item too. You'll find everything from BBQ covers to cook books right here on the BBQ World website. 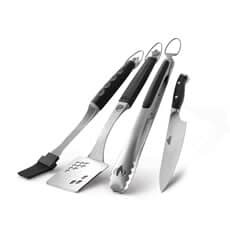 With your own barbecue knife set, which can include utility knives and carving knives as well as steak knives and dinner knives, can completely alter the outdoor cooking experience. 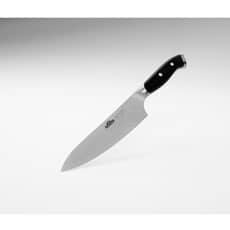 Buy them individually, if your requirements are quite limited, or buy a full set of knives. 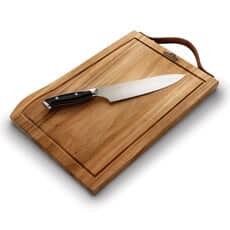 Use them for cutting, chopping, and dicing, and make sure that you choose those that are made from the best materials because material choice has a huge impact on how effective a utensil is. 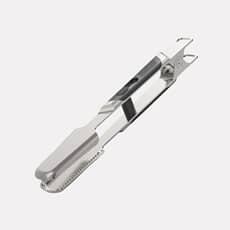 Stainless steel is the most common material used in the construction of cooking knives, and quality matters when it comes to buying products made from this material. If you have any questions about stianless steel grade or anything else to do with out barbecues and barbecue utensils, feel free to pick up the phone and give us a call - if we can answer your question or provide you with the information you need, we will do whatever we can. Barbecues can obviously become very hot, but through a combination of alcohol and sun, it can become very easy to forget just how hot they are. Even the food, which is often prepared under a barbecue lid and therefore attract even more heat, can be too hot to touch. This is where items like forks and tongs are especially useful. Their design means that they won't get too hot to handle, and the materials will not become damaged when they get too hot. A meat tenderiser is used, as the name suggests, for tenderising meat before you cook it. Essentially, the tenderiser looks like a hammer but with a serrated head. You can use this to hit the meat, flatten it out, and thin it down. Tenderised meat not only tends to be softer, but it can also be more convenient and simpler to cook. The burger is the main event at most barbecues, and whether you prefer plan beef or you would rather opt for a modern gourmet burger, the success of your patty will depend on its uniformity as well. Add a binding agent to your meat to prevent the mince from falling apart, and use a burger press to help squeeze the patty into shape. The uniform shape of the burger means that you will enjoy uniform results, so you are a lot less likely to endure burned bits in your recipe. While not as popular as burgers, skewers have become another essential barbecue food component. They enable you to cook any type of meat, including chicken, and are especially useful for those that are not otherwise convenient enough to place on the barbecue. You can also use skewers to cook vegetables, or you can try cooking fruit on them too. Skewers tend to be a single size, but this isn't necessarily always true. They may also be made from a choice of metal or wood, with wood obviously having a shorter lifespan than the metal models. 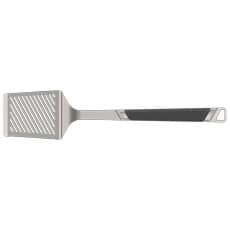 The basting brush presents a great way to enhance the flavour of any meat or vegetable. Create a mop or baste sauce, use the brush to liberally coat the food, leave it to rest, and then reapply more of the baste. The process is simple but can have a huge impact on the quality of the flavour of the food. Don't be afraid to experiment with ingredients, but don't compromise on the quality of your basting brush and other accessories. 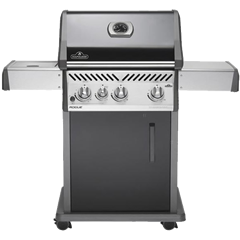 BBQ World is the official website of Dawson's Department Store. Call us with questions, call in to see every category and product that we sell, or buy items like BBQ utensils on the Internet. Enjoy competitive prices and benefit from free delivery on all orders over £50 if you order today.